My wife, Sue Fagen, with Brother Barks and Brother Cushman on our wedding day at Dr. Bernard Boyd’s home. 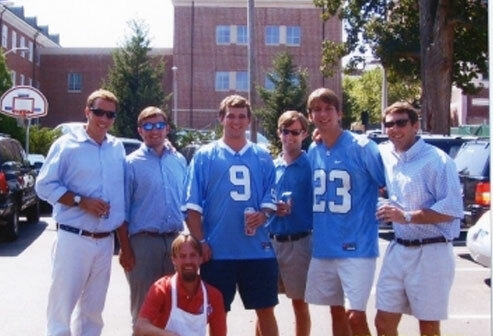 “My NC Beta takeaway: You socialized this skinny Tennessean who arrived in 1955 in his jeans and engineers boots. For four years, you provided a home, an assortment of brothers with common (and uncommon) interests, a framework for courtship and a maelstrom of activities that encouraged efficiency in the pursuit of academics. It was an unusually supportive environment that saw me out of my teens and into my twenties. Real life unrolled the day I graduated when I married Sue Fagen, a Carolina Pi Phi, and we immediately embarked on a 100 day honeymoon in Europe with a VW bug and a tent. I got a bit more book learning in Seattle (MS), then was hired in 1961 as a mathematician by the US Navy at Pt. Mugu, California. The Navy immediately sent me to a Quonset hut on the beach to learn about an imminent and huge IBM computing machine (709). This was fun, paid fun, and I spent the next 34 years in the software business (31 of them with an early software company, Informatics Inc). On a hike near the Swiss-Italian border September 2015. We retired in 1995 while we were still healthy enough to walk a few more trails and cycle a few more roads. We settled into a lifestyle that was about half travel (mostly abroad) and half at home in Palo Alto. We soon stumbled into a part-time occupation developing detailed travel packages for a small Canadian company that specialized in self-guided hiking and cycling tours—“work” that, for nine years, took us on foot and on bike to unfamiliar corners of Europe and Canada. After a few years of retirement, our spreadsheets were still predicting that our assets would last longer than we would, and we began a program of philanthropy that ultimately became focused on supporting local non-profits (we can walk to the world headquarters of each, and as a result we can easily follow the effect of our donations). Our favorites continue to be a scholarship program for poor, first-in-family college students, a micro-grant program for underfunded teachers in East Palo Alto and a very ambitious farm and open space trust. Another grey-haired cyclist came up from behind me rather quickly on a Stanford bike path six days ago and sideswiped me— he survived, but I have a broken hip. It is now pinned, and I am home, alternately sleeping, exercising and looking back upon a life launched 60 years ago in Chapel Hill.